Cross-posting this bit I wrote for the official Oracle Application User Experience blog, enjoy. Recently, at Oracle CloudWorld in New York, Oracle President Thomas Kurian talked about how emerging technologies can change the way you do your job for the better. Investigating this impact is the primary focus of the AppsLab, the Oracle Applications User Experience (OAUX) Emerging Tech team, and it is what my team and I explore every day. A recent post on Forbes.com, “3 Examples Of How Emerging Tech Will Change Your Work,” examined three specific ways emerging technology could be incorporated into enterprises. In this post, we’re going to tell you about the research we’ve done on a few of those technologies, specifically artificial intelligence (AI), autonomous experiences, ambient interfaces, and the Internet of Things (IoT), and discuss our findings on how these technologies might affect your work and improve your user experience. The term AI covers a lot of territory, but generally speaking, it refers to intelligence demonstrated by machines. Like many people, we’re also fascinated by the efficiencies AI could produce in the workplace. Rather than building a giant artificial brain, we’ve decided to start smaller — with chatbots. We began thinking about ways to automate tasks using bots in 2010, but we didn’t begin developing exploratory projects in earnest until late 2015. As with most of our projects, we started by asking questions and researching ways people thought chatbots could help them do their jobs more efficiently. By OpenWorld 2016 we had a working prototype, just in time for the big announcement of the Oracle Intelligent Bot Cloud Service. Our chatbot focused on tasks that Oracle Cloud Applications users wanted to streamline, such as simple human resources (HR) tasks like payroll and vacation queries that could be performed in applications already familiar to the user, using tools they already know how to use such as text and instant messaging. We continue to gather research by showing chatbots in the Cloud UX Labs at Oracle HQ, and we now have several bots for different domains within Cloud Applications, including HCM, Sales, and ERP Cloud. 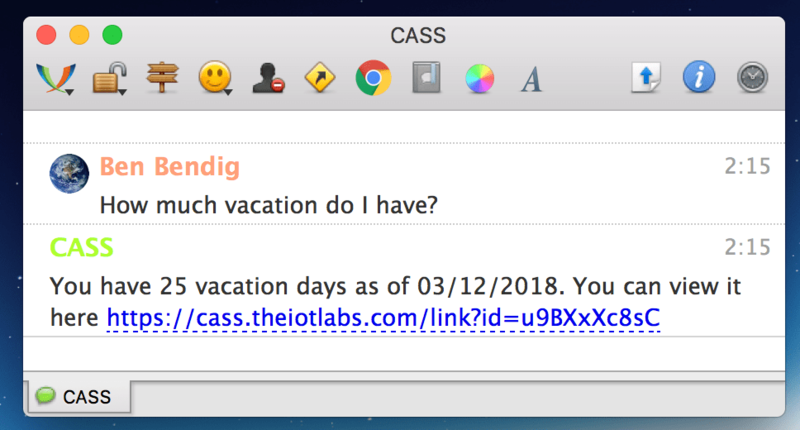 The feedback from people who see these chatbot demos typically is very positive; they can easily see the value of texting a chatbot with a simple inquiry like, “Did I get paid my bonus?” or a more complex one like, “Can I take vacation this Easter?” Getting instant answers to questions like these creates a valuable efficiency that resonates with all Oracle users. Through our research on chatbots, we discovered many cases where the AI we were building could save time by making basic assumptions for a user and automatically composing something in the system. At Oracle OpenWorld 2017 last September in San Francisco, we demonstrated an expense bot. Usually, expense reports require a fair amount of manual work, but we found simple ways to automate the process. For example, the demo shows the bot automatically uploading and parsing pictures of receipts. It then determines the amount of the expense and the time of day, makes an assumption on the type of expense, and creates an expense report. Several steps in creating such a report are now automated. 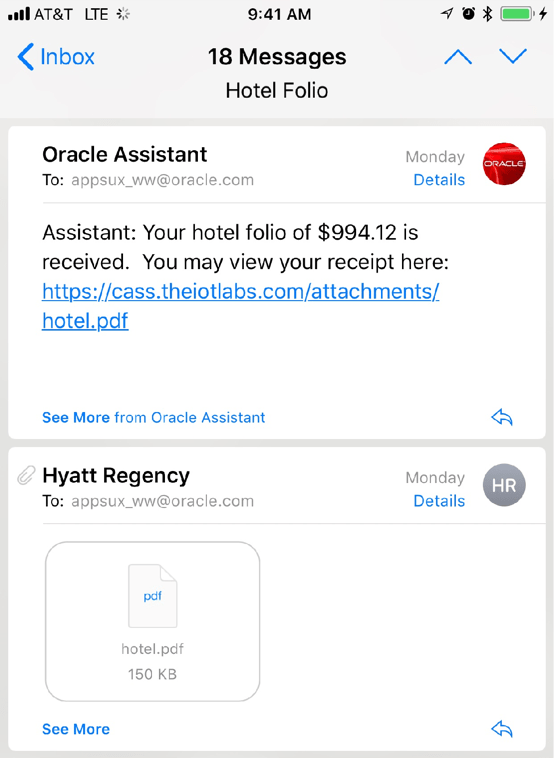 Another feature of the expense bot monitors the user’s email inbox for pdf receipts, such as hotel folios or rental car receipts, then uploads and parses them to itemize and categorize the expenses automatically. This was all done via a chatbot that simply notified the user when expense items were created and ready for use. When the user was ready, an expense report was created and submitted. We also built in an option where, if any policy violations occurred on the expense report, the user could login to ERP Cloud to review and rectify them. 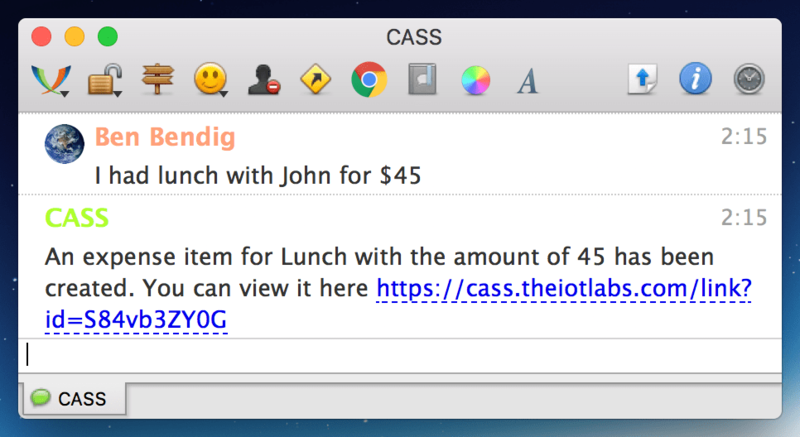 No one likes doing expenses, so people who see this demo are happy to offload the pain to a chatbot. Plus, we found new insights that can be valuable, such as automatic itemization of hotel folios, which allows for local tax comparisons that could lead to savings. For several years, ambient interfaces have interested us. At CloudWorld, Kurian referred to “ambient human interfaces” as virtual assistants that users interact with by voice. Our investigations into ambient interfaces have included virtual assistants, as described in the previous sections, but we also view them as the next iteration of smartphone notifications, passively showing only the most important information. At Oracle OpenWorld 2016, we showed an ambient visualization; the original goal was to create a piece of art that changed based on information gathered from the room. Anyone who understood why the visualization changed could get real-time data on where people were in the room, but to everyone else, it was just a piece of dynamic art. As with many of our projects, this was a research initiative. By giving an example of what we meant by an ambient interface, people could apply their own knowledge to give us valuable examples of how this type of interface would help them with their work. The connected world around us has been an area of personal interest for our team for nearly a decade, and a few of our team members have been building internet-connected projects at home since before the term Internet of Things (IoT) was coined. This long history has led to several IoT projects, including a real-world Smart Office in our lab at Oracle’s headquarters in Redwood Shores, Calif., and its portable equivalent that has been shown around the world. We also developed an IoT-based Community Quest with Oracle Developers at OpenWorld 2015, and our IoT workshops have been part of Oracle Code events since the program began in 2017. And at last year’s OpenWorld, we collaborated with the Oracle IoT Cloud Service team, Oracle Developers, Relayr, an Oracle partner, and Alpha Acid Brewing Company to create IoT Cloud Brewed Beer. Our focus recently has been on making the sensor-filled environments around us more valuable. Now that physical spaces and objects are collecting data, what efficiencies can we uncover in that data to benefit our work? As always, we’ll be conducting research first, asking questions, and listening to people. Janelle on Website vs. Web App? C. Cole on Is Touch-Typing an Obsolete Skill? Dahlia Legacy on Is Touch-Typing an Obsolete Skill? P on Is Touch-Typing an Obsolete Skill? Doreen on Is Touch-Typing an Obsolete Skill? The views expressed on this blog are those of the authors and do not necessarily reflect the views of Oracle.